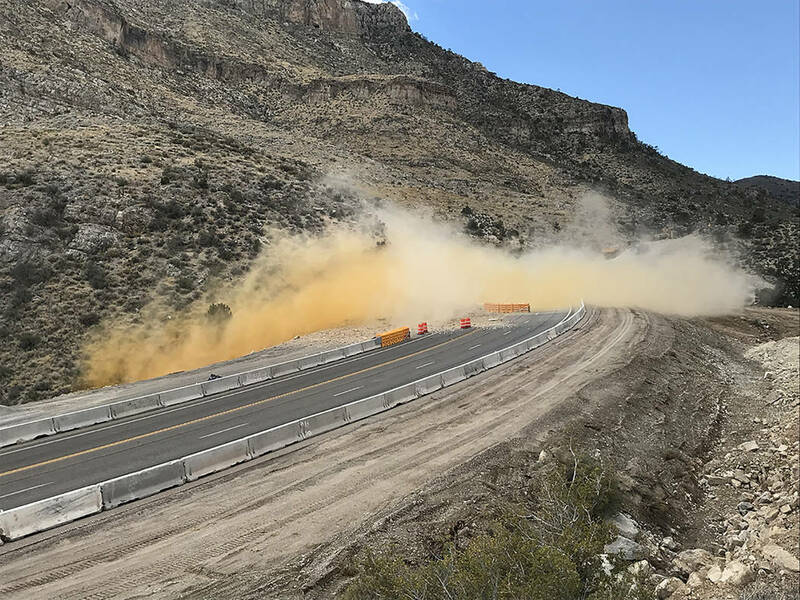 Crews are continuing their blasting work along Nevada Highway 160, the route connecting Pahrump with Las Vegas. David Jacobs/Pahrump Valley Times Motorists could experience delays in the mountain pass, along Highway 160. Blasting is occurring east of Mount Potosi Canyon Road. Expect delays during the work. Nevada Department of Transportation A blast is shown along Nevada Highway 160 on Oct. 5 as crews continue their work on the project. 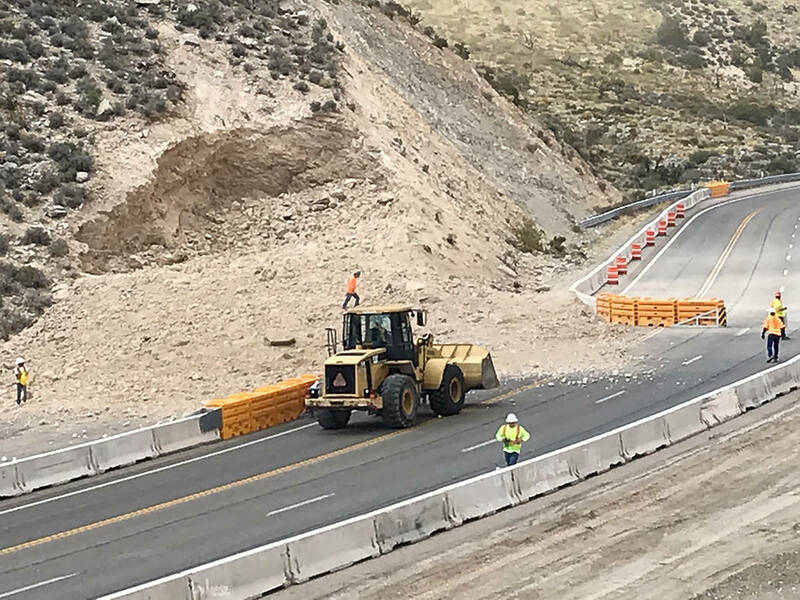 Nevada Department of Transportation The Oct. 5 blasting effort removed fractured bedrock outcroppings for a $58.6 million, six-mile-long highway widening project that began this summer, the Nevada Department of Transportation said. Nevada Department of Transportation NDOT began blasting in the Mountain Springs area starting Sept. 24. This photo was taken Oct. 5, a day when blasting worked continued. The effort removed fractured bedrock outcroppings for a $58.6 million, six-mile-long highway widening project that began this summer, NDOT said. 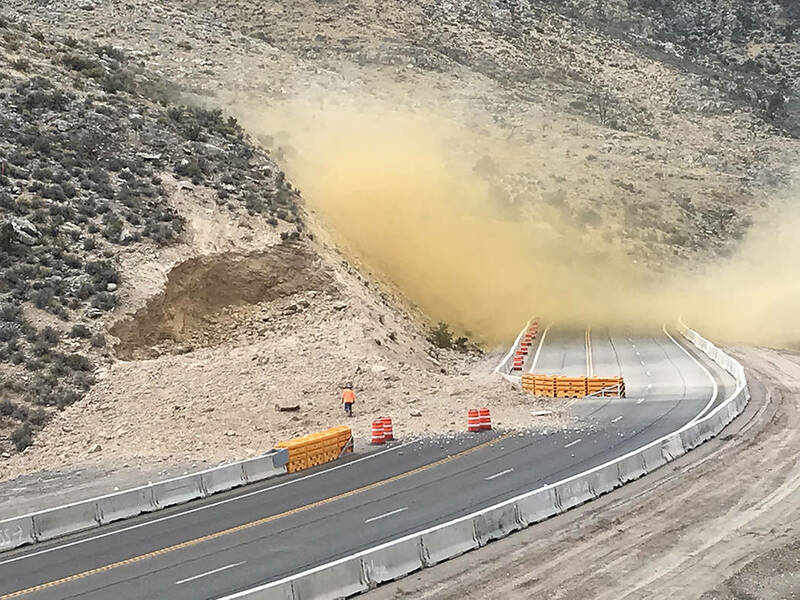 Additional blasting and a temporary highway closure was set for Tuesday, Oct. 9, from 12:45 p.m. until 1:30 p.m.
“Cleanup and associated travel delays will last longer than recent blasts, as work is occurring in areas of steeper, taller rock zone,” NDOT said in a statement. The area is east of Mount Potosi, in southwest Clark County. NDOT began blasting in the Mountain Springs area starting Sept. 24 with plans calling for that to continue through Oct. 15 east of Mount Potosi Canyon Road, in southwestern Clark County. Delays for motorists are expected, as the highway will be closed during the blasting period, according to NDOT. Motorists do have an option to use other routes, including heading north on Highway 160 toward U.S. Highway 95. Once Highway 95 is reached, motorists would turn right (south) toward Las Vegas. The U.S. Highway 95 alternative route does add mileage and travel time to the typical trip through the mountain pass to Las Vegas. The planned blasting may cause some delays for emergency vehicles. That portion of the nearly $59 million project will occur between mile markers 16 and 22, which start east of the mountain pass and heads to the western edge of Mountain Springs. 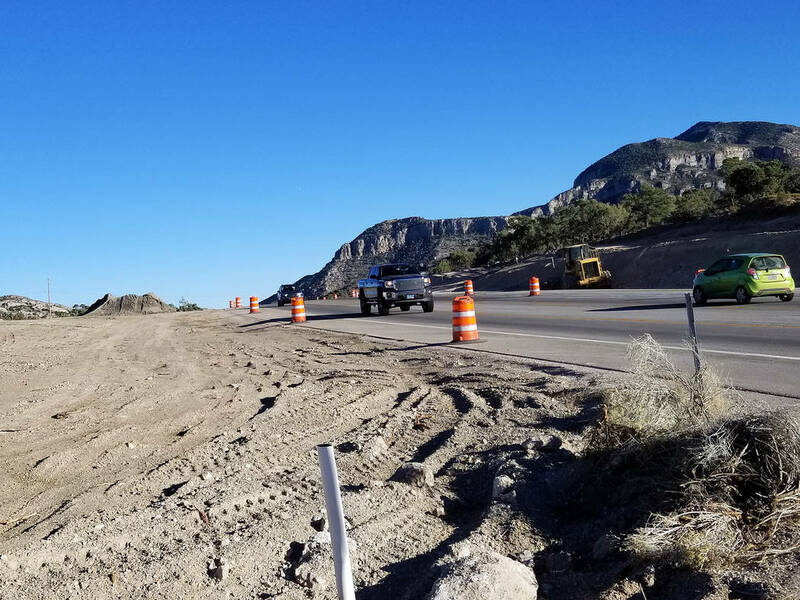 The contractor of the project is Aggregate Industries SWR Inc.
A rebuilding and paving project on Highway 160’s eastbound lanes, from the western edge of Mountain Springs to around the Nye County line, is also part of the project planned for completion in August 2020. According to previous comments by Illia to the Pahrump Valley Times, the overall project will occur segmentally. For more information about conditions on Nevada’s highways, head to NvRoads.com or call 511. NDOT also uses the Waze app to inform the public about planned highway restrictions. “But unscheduled construction changes, closures and restrictions are possible due to weather or other factors,” NDOT stated in a release.